Posted on Oct.27, 2012 by Barry Bookmark the Permalink. 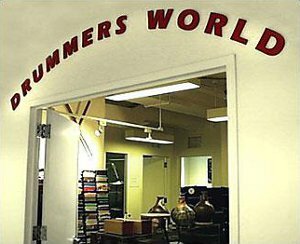 Drummers World was established in 1979 on West 45th street in New York City with the concept to provide serious and professional drummers and percussionists with instruments of the highest quality available. Within months the store began attracting players who desired an alternative to the more established music stores in the New York area. A variety of drummers became customers because of the diversity of instruments. With a range of ethnic and folkloric drums, the store first attracted Brazilian percussionists who could experiment with the specialized items they previously found only in Brazil. Many jazz drummers were compelled by the wide selection of smaller size drum kits and imported Turkish handmade cymbals. Classical percussionists were intrigued with the selection of professional tambourines, triangles, timpani/keyboard mallets and keyboards. The store prided itself on doing expert repairs in a timely manner. In 1990 the store moved one block north to West 46th street. 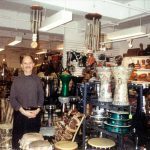 Because of space limitations it moved in 1996 to another location on the same street which doubled the previous space in order to accommodate the store’s wide range of world percussion. In the late ’90’s, Drummers World began building the nesting drumset which was recognized as the epitome of traveling outfits for the jobbing drummer. Endorsed by players from many countries because of the sound quality and portability, the drums were made by hand on the premises. 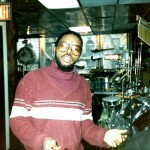 Acknowledged as “New York’s Percussion Headquarters” Drummers World attracted and became a meeting place to the drum community. All drummers and percussionists felt “at home” in the shop. The store closed in late 2011 due to the economic conditions common to the 48th Street “Music Row” area, leaving many of its customers at a loss. Because of the uniqueness of the products it sold and popular demand for the friendly, courteous and efficient service that only knowledge and experience can provide, Drummers World decided to launch this e-commerce site in 2012. We will consistently be adding new and recommended items for the discriminating percussionist, hoping to bring you the unique to further the creative spirit. Steve Singer, drummer/photographer, was in attendance at Elvin’s 2001 clinic at Drummers World with camera ready. He took this pic of Elvin and his wife Keiko after the clinic as they were mingling with attendees. The “Elvin look” is obvious. His eyes rolling in combination with that grin could charm a snake! 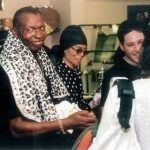 I’m proud to say I have known Lewis Nash since he arrived in NYC in the early 80s working with Betty Carter. His discography is endless, being on over 400 albums, and he continues to travel and perform internationally with major artists. He has had much success and remains the same humble being as always. 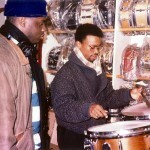 Greg Hutchinson and Clayton Cameron at Drummers World in the mid 1990s. Both of these guys are masters at what they do. This was an impromptu demonstration Clayton was giving and you can see Greg is all eyes. Whenever Clayton would come into the shop he always attracted frustrated brush players looking to pick up tips.